Scott My name is Scott Buel. I run a vintage and antique picture shop called Scenes from the Past. I'm recently married to Amanda in October 2010. Although we live in the Washington D.C. metro area, I am originally from Michigan and my love for my home state is partly what inspired my Zazzle store. I wanted to help preserve history and get it out where people can see and enjoy its beauty. Scott I started my Zazzle shop, Scenes from the Past, in 2008. I found them when I left another website that is more geared toward professional photographers. In 2005, I took over my grandfather's antique photo and postcard business. He had built up a collection of images over a period of 40 years mostly in the topic of the Great Lakes shipping industry and railroading. But also of old images of towns from all over Michigan. My grandparents were antique dealers for 30 years or so and he sold in all kinds of shows and antique malls. When he started slowing down, I recognized an opportunity to keep the business going, so he gave me his pictures to bring to the internet. He has a collection of 80,000 images or so in all kinds of formats- glass plate negatives, old postcards, odd shaped formats that were obsolete and forgotten, slides, etc. He also became quite the prolific photographer in his own right during that time. So, I started a multi-year project to have them digitized. When the first website I mentioned didn't work out for generating revenue, I canceled my subscription and eventually Googled my way to Zazzle. I was immediately impressed with the wide selection of products I could sell my Grandpa's images on. I also found the creation process to be fairly easy. I also thought it was great that they could offer this service for free-- no subscription fees! Scott I only have the single store at Zazzle. 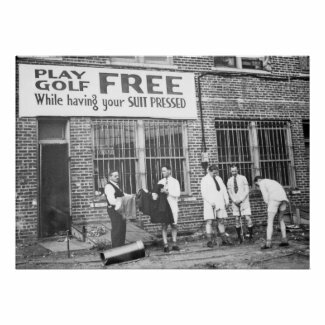 Scott My best selling product is a poster called Play Golf Free (While Having Your Suit Pressed). Scott When I'm not working on my store, I'm very busy working on applying metadata to the images in my archive. That is also proving to be a multi-year project. In the end, I will have a fully searchable and keyworded library of all of my Grandpa's images. I'm a huge history buff and a tech geek who married an archivist, so this is all a natural fit. Besides enjoying working with my image archive, we enjoy visiting all of the rich historic attractions in D.C. like museums, Civil War battlefields, etc. Scott I have to split my time up because I also have a day job as a proposal writer for a federal contractor. I sneak in Zazzle work whenever I can and take advantage of lunch hours, evenings, weekends, and holidays to create products. My wife, Amanda, is very supportive of my Zazzle work because it has paid off. My earnings last year paid for a nice chunk of our wedding! Scott I think I reached ProSeller status sometime in 2009, so about a year. The ProSeller Corner Getting noticed and becoming a ProSeller takes a lot of hard work and time. What advice would you give to those aspiring to become a ProSeller? Scott Be patient, keep creating products. Use good keywords and don't be spammy. Read the forums and see what is working for other sellers. I love this story. :) Truly a great shop and I can see myself buying some posters when I get my own place.